A Chinese man who underwent a procedure to have a replacement ear grown on his forearm has had it successfully transplanted to his head. Known as Mr. Ji, the patient claimed he had not felt complete since losing his ear in 2015 following a traffic accident. 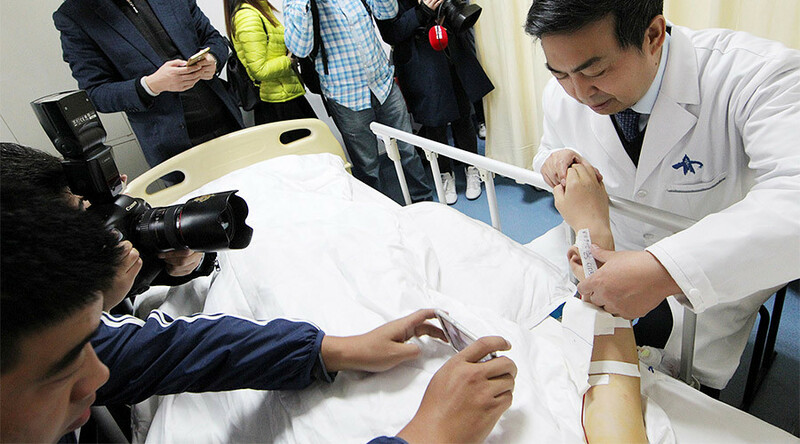 The ear, which had been growing on Mr. Ji’s forearm since November last year, was moved to his head on Wednesday by a surgical team that carried out the final stage of the seven-hour procedure at a hospital in China’s Shaanxi province. Microsurgical techniques were used in the lengthy procedure, reported China Daily. Using a Doppler blood vessel detector, the flow of blood could be heard in the ear, confirming for doctors that the transplant was a success. The ear appeared pink under the operating room lights, a positive sign for transplant surgeons. The process of replacing Mr. Ji’s lost ear was divided into three stages: First, a skin expander was implanted under his right forearm, followed by cartilage from his ribs. Once this organic structure was in place, the team could then remove the new ear safely. This was the most complicated piece of the surgery, Dr. Guo said. The successful final stage marks an end to a lengthy reconstruction journey for Mr. Ji, who underwent several procedures since the accident, including having facial skin and cheek restoration surgeries. Mr. Ji said in November that the loss of his ear had caused him sorrow. He sought conventional medical help and was led to Dr. Guo, who reportedly carried out China’s first face transplant in 2006. China Daily reported that Guo and his team regenerated about 500 ears for children each year.